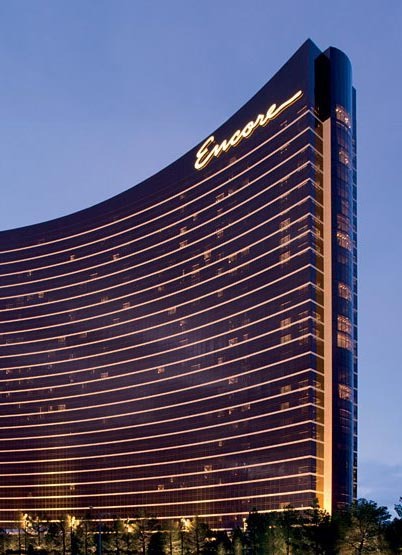 Encore Las Vegas or Encore at Wynn Las Vegas (often just called Encore) is connected to its sister resort, Wynn Las Vegas; both are owned by Wynn Resorts Limited, headed by casino developer Steve Wynn. Encore has been awarded the AAA five diamond award. The Towers Suites at Encore and The Spa have received the Forbes five-star award in 2011. Encore Las Vegas and its sister property, Wynn Las Vegas collectively hold more Forbes five-star awards than any other casino-resort in the world and it is considered to be one of the finest hotels in the world. Casino: Yes, a 111,000 square foot casino. Race & Sports Book: No, but there is a 195-seat race and sports book at the adjacent Wynn Las Vegas. Restaurants: Yes, five restaurants. Chef Theo Schoenegger’s Italian restaurant Sinatra’s, Chef Jet Tila’s Asian bistro Wazazu, Chef Rene Lenger’s steak and seafood restaurant Switch, Chef Mark LoRusso’s steakhouse Botero Steak, and Chef Kim Canteenwalla’s take on a classic American restaurant in Society Cafe. Entertainment: Le Rêve is the featured show next door at Wynn Las Vegas. Nightlife: One of the hottest and largest nightclubs in Vegas is XS, along with the indoor/outdoor Surrender Nightclub. There are seven bars at the resort including, Botero Bar, Eastside Lounge, the Lobby Bar and Cafe, Southside Bar and Switch Bar. Attractions: There is a sunlit atrium at the property’s main entrance and fine art throughout. Pool: Yes, a European-inspired pool area. Spa: Yes, The Spa and Salon at Encore. Shops: Yes, the Esplanade at Encore has 11 shops including Chanel, Hermès, and Rock and Republic stores. Convention Rooms: Yes, 60,000 square feet of meeting space. Parking Garage: Yes, and valet parking also. Shuttle Service to the Strip: No, but shuttle service to the Las Vegas Convention Center is available. Standard Room Amenities: Air conditioning, floor-to-ceiling windows, seating area with couch, table, chairs and ottoman, bedding with 320-thread count European linen, automatic bedside drapery-controls, flat screen television, cordless phone, fax, soaking tub, separate glass-enclosed shower, private toilet, his & her sinks, TV in bathroom, hair dryer, electronic door locks, alarm clock and radio, laptop-sized in-room safe, iron and ironing board, pay-per-view movies, voice mail. Incidental Charges: The Encore has a mandatory $20 per room, per night resort fee. This fee is not included in your reservation and will be collected by the hotel at check-in. This fee applies to all rooms except the Tower Suite room type. the Tower Suite room type does NOT have a resort fee. The resort fee includes: daily access to the Fitness Center (does not include wet rooms or spa facilities), in-room high-speed internet access, unlimited in-room local and toll-free telephone calls. A credit card is required for incidental charges.